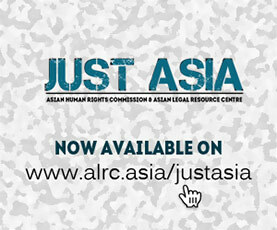 The Asian Human Rights Commission (AHRC) has received information regarding the terror and intimidation experienced by Mr. Theo Hesegem, a Papuan human rights defender. Prior to this intimidation, Theo advocated against the Yahukimo Regent’s abuse of power in unlawfully dismissing 199 village heads. While this has been reported to the authorities, no action is being taken. 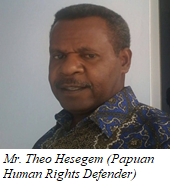 On 25 June 2018, Mr. Theo Hesegem, a senior and credible human rights defender from Papua, was threatened and intimidated by the campaign team of the Regent of Yahukimo, Mr. Busop MA. According to Mr. Theo, the campaign team, a total of four people, came to Theo’s house. They came by two cars and parked in front of the house without any permission. When they reached the house, the four people suddenly shouted that they will kill Theo. Without enough evidence, they accused Theo of stealing money belonging to Air Garam village, Kurima district, Yahukimo regency. Although Theo said he does not know anything about the money, the four persons insisted that Theo has stolen the money. According to Theo, this intimidation is related to his advocacy for 199 village heads who had been dismissed by the Regent of Yahukimo on 26 April 2018. Theo told the media that this dismissal violated Law No 6 of 2014. This provoked the Regent’s anger. While Theo has communicated this problem to the Papuan governor and the Chief Police of Papuan Regional Police Office (Kapolda Papua), Police Inspector General Boy Rafli Amar, as of yet nothing has been done to address the problem. Please write to the authorities listed below. Ask them to ensure that the intimidation and death threats against Mr. Theo Hesegem must be stopped. The police and local government of Papua have to immediately address the problem. In addition, the police should investigate any form of terror and intimidation committed by the Yahukimo Regent’s campaign team. The AHRC will write a separate letter to the UN Special Rapporteur on the Situation of Human Rights Defenders calling for his intervention in this matter. I am writing to voice my deep concern regarding the terror and intimidation experienced by Mr. Theo Hesegem, a Papuan human rights defender. Prior to this intimidation, Theo advocated against the Yahukimo Regent’s abuse of power in unlawfully dismissing 199 village heads. While this has been reported to the authorities, no action is being taken. Therefore, I respectfully request you to ensure that the intimidation and death threats against Mr. Theo Hesegem must be stopped. The police and local government of Papua have to immediately address the problem. In addition, the police should investigate any form of terror and intimidation committed by the Yahukimo Regent’s campaign team.